Russian billionaire Mikhail Prokhorov will purchase a 21.75% stake in Uralkali – the world's largest potash miner – from the current biggest share-holder, Suleiman Kerimov, for an estimated $4.3 billion. The move could lead to a revival of the world's largest potash export cartel between Uralkali and Belaruskali, but prices aren't expected to rise, Bloomberg writes. Although Uralkali shares rose immediately following the announcement, it's unlikely that potash prices will recover from the beating they've taken since the cartel broke up in July, a VTB Capital analyst in Moscow told Bloomberg. Stockpiles of the crop nutrient are also growing, making a price rebound even less likely. Last week Reuters reported that North America's potash inventories rose by 2% in October, due partly to weak demand from China and India. Relations between Russia and Belarus became very tense following Uralkali's exit in July. Belarus depended on Belaruskali for 20% of its annual budget, according to the Financial Times. Shortly after the breakup, Belarus arrested Uralkali's CEO Vladislav Baumgertner. Tuesday's sale could lead to his release, as Kerimov's exit from the company is one of Belarus' preconditions. According to Reuters, Kerimov was reluctant to sell but agreed to do so for Baumgertner's sake. But the CEO would also have to repay the country damages of $100 million, Belarusian President Aleksandr Lukashenko has said. Prokhorov will make the purchase through Onexim, his investment firm. Onexim CEO told Reuters that the stake in Uralkali is a "long-term investment in a company that is unique from the standpoint of its position in its industry and its role in the world economy." 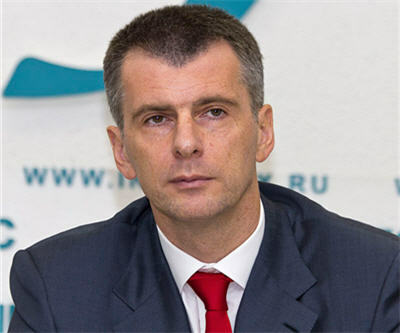 Prokhorov, whose fortune is estimated at $13 billion, is also a politician. He ran against Vladimir Putin in the 2012 presidential election. Prokhorov also owns the Brooklyn Nets basketball team.